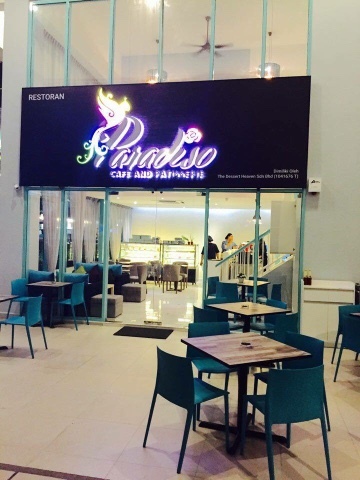 Latest new kids on the block of Sunway Nexis, Paradiso Cafe and Pattisserie are owned by Malaysia's top chef Azizan Shukri. 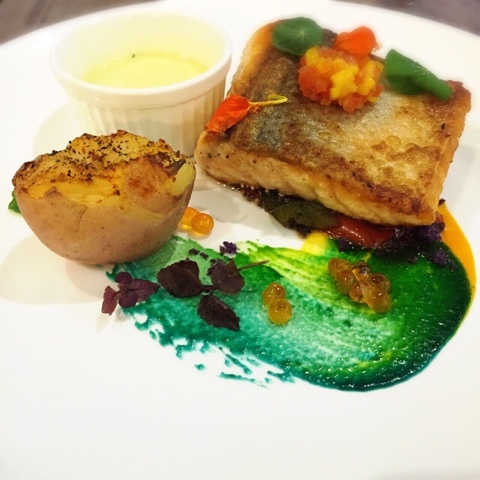 Chef Azizan well-known for his fine Italian cuisine has cooked for Bill Clinton, Michelle Yeoh and former prime minister Tun Abdullah Badawi. I am honoured to be invited for a preview of his cuisine before his restaurant is officially open. 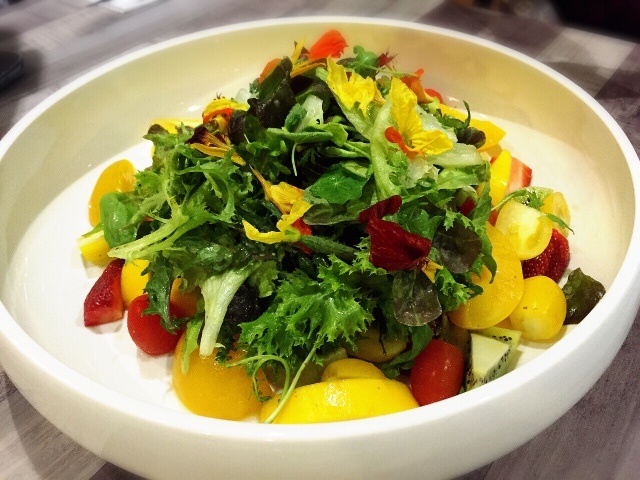 Colourful fresh salad with kiwi, strawberry, peach, mango served with mesclum, honey vinaiggrette, mustard and olive oil. So appetizing! Try this, if you fancy a little seafood in your greens. 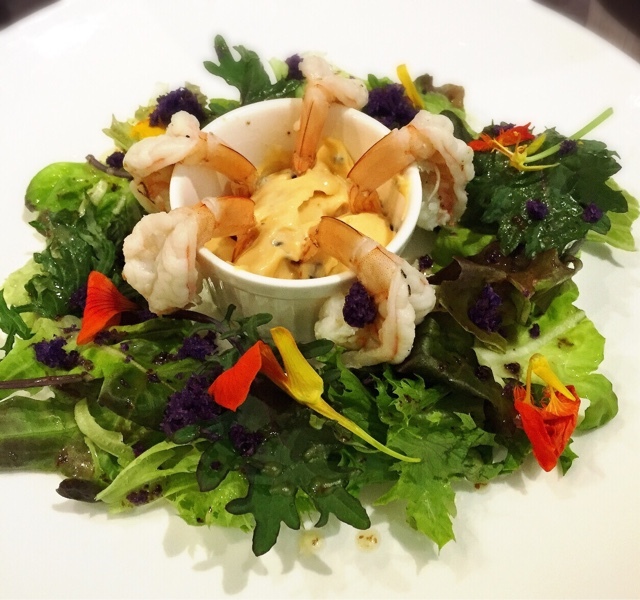 Bring usual salad to a whole new level, with sweet succulent poached prawn dipped in the creamy chilli mayo and mesclun finishing. 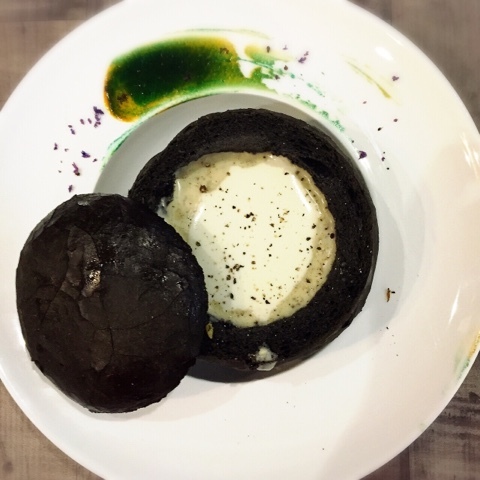 Mushroom soup served with in-house made charcoal bread bowl. Must try! The top cover is crusty and lightly toasted with garlic butter. Pipping hot thick and rich in flavour soup with generous crunchy button mushroom. 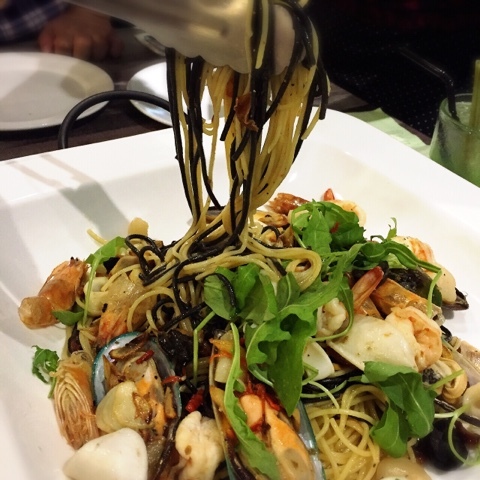 Al dente black and white pasta tossed with abundant offer of fresh seafoods, rocket salad and olive. Simply taste good and satisfying, just terrific. Pan-seared juicy fresh salmon trout served with in-house made creamy lemon butter and dill herbs sauce. The salmon is moist and tasty while the crispy skin is such a treat. I would prefer if the sauce has a much stronger lemon taste though. 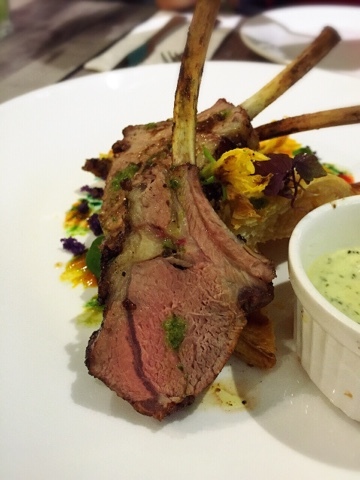 Perfectly done rack of lamb served with mint, capers and cream sauce. 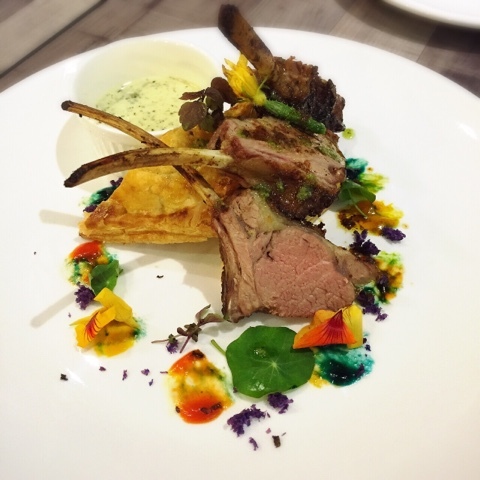 Well seasoned, tender and juicy lamb to die for. Balance your taste bud with the sweet pineapple tart. Sinfully good Chocolate Crunchy Mousse Cake RM18. 1) Bubble Gum - Mango juice with peach lychee and green apple. 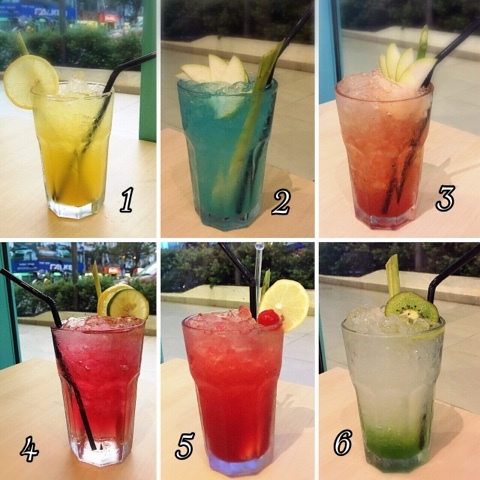 2) Lime Mistic - Lime juice with green apple and blue lagoon. 3) Cooler Paradiso - Apple Juice with green apple, lychee blood orange and mint. 4) Pink Panther - Cranberry juice with strawberry and peach. 5) Cranberry Mint - Cranberry juice with lychee and mint. 6) Sparkling Kiwi Granite - Lime juice with kiwi lychee and green apple. 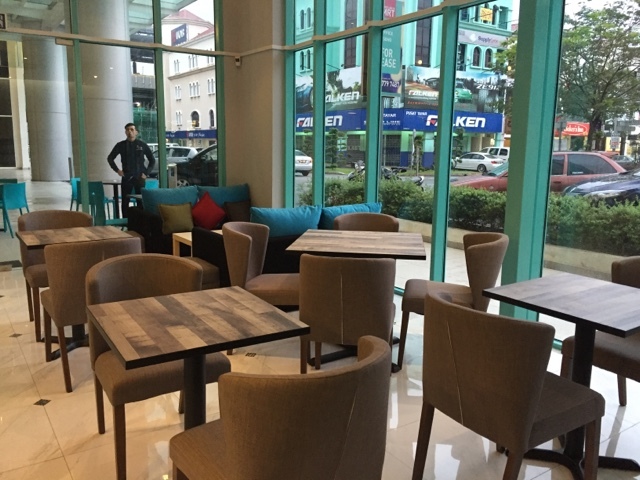 Cosy ambiance, wood toned tables and chairs, the interior are brightly lit with natural light. All in all, it was an amazing dining experience at Paradiso. 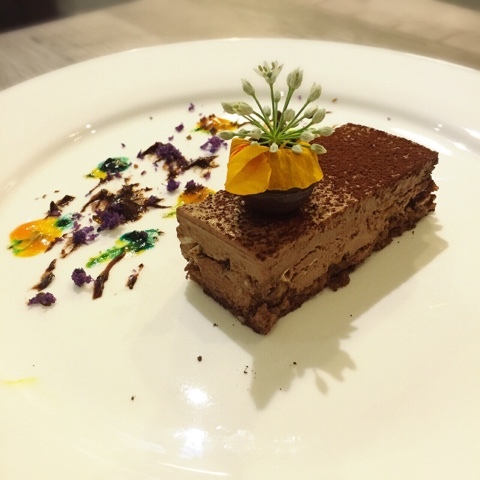 Stunning edible flowers food plating and delicious foods that will tickle your taste buds. This is the best place to impress someone special with an unique beautiful dining experience. Truly amazing!